Today Apple has unveiled Siri, a new feature which lets you do things just by talking to your iPhone. Well, it’s not like Apple unveiled Siri, it existed in its own right and Apple acquired it, but that’s beside the point right now. Basically it’s Apple’s new and highly anticipated new voice command system. You can use it to control the iPhone to find out what the weather, find out things from Wikipedia and most importantly of all, use it to create text messages and emails. Now if you’re thinking that sounds GREAT, why hasn’t anyone else come up with this in the past?! Then you’d be right. Because they have and it’s called Vlingo. 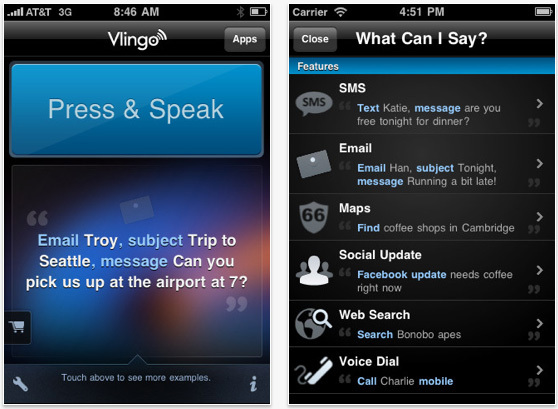 Vlingo is a voice recognition app and virtual assistant all rolled into one which aims to get things done and make you more productive and your life more streamlined. So, yep, pretty much exactly the same as Siri but available right now on most operating systems. Visit the Vlingo website to download the application. stop laughing now = stop anything how? I agree. I totally understand that replying in a tweet is easier and small points can be made, but if someone is wanting a meaningful discussion then it really has to be in the comments in my opinion. That way I also know that the person commenting has actually read the content before they make judgements, as on Twitter I find far too many people start getting angry when they’ve only read the title! And Vlingo is great, at least on Android it is, can’t speak for Apple. It just works and has quite frequent updates where it gets better and better. I’ve commented here, as requsted as I agree it’s much better on the post than on Twitter!